You can call it what you want, a coming-of-age novel, a novel about brothers, about families, about what it feels like to not quite belong. You could call this book any of those things and be right, but at its core, this is a novel about perception, about perspective, about what it feels like to live in a world that is constantly shifting, how these shifts change you, and how they change the people you love. 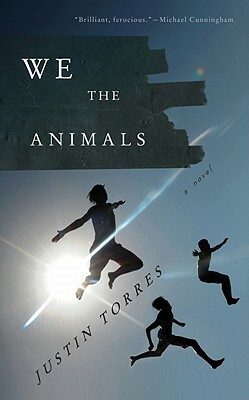 The story is told, technically, from the perspective of the youngest of three brothers, though throughout most of the novel, Torres uses first-person plural, telling the story as if from the brother’s joint perspective. The boys are considered a unit of three, and while we see hints of the detachment to come, it is not until the end of the novel, the intentionally jarring moment when his two brothers become “they” that we truly understand the reality of their separation. The volatile world these boys live in is controlled in part by their Puerto Rican father, and their young, white mother, “this confused goose of a woman, this stumbler, this gusher, with her backaches and headaches and her tired, tired ways, this uprooted Brooklyn creature, this tough talker, always with tears when she told us she loved us, her mixed-up love, her needy love, her warmth…” This is a book about coming to terms with the fact that all people are made of more than on part. Their mother: part compassion, part despair. Their father: part leader, part ticking bomb. The boys: part Puerto Rican, part white, part brother, part self. Paps turned the stereo even louder, so loud that if we screamed, no one would have heard, so loud that Paps felt far away and hard to get to, even though he was right there in front of us. Then Paps grabbed a can of beer from the fridge, and our eyes followed the path of the can to his lips. We took in the empties stacked up on the counter behind him, then we looked at each other. Manny rolled his eyes and kept dancing, and so we got in line and kept dancing too, except now Manny was Papa Goose, it was him we were following. From there, the father yells commands to his boys. Dance like you’re poor, he says, like you’re rich, like you’re white, like you’re Puerto Rican. They have fun trying. They are enjoying themselves. Then the room changes. “Mutts,” he calls them.“You ain’t white and you ain’t Puerto Rican.” This is a book about wanting to be something else than what you are. This book, though short, works as a sort of bell curve of events. The scene in which the father tries to teach the youngest to swim mirrors itself at the end of the book, as the father holds his son over the edge of Niagara Falls, asks him he knows what would happen if he let go. This time he doesn’t. This time he pulls him back to safety. “I stood in the doorway, watching you dance, and you know what I was thinking?” He paused, but I didn’t answer or turn to look at him; instead I closed my eyes. Maybe this is a coming-out story, though, if it is, it is more than that. It is about coming to terms with yourself, your sexuality, your emotions, your past. This unnamed narrator, this youngest brother, is more than the sum of his parts. He is Puerto Rican and white and gay. He is a brother and a son and an individual. He is sensitive and strong and unstable. When it comes down to it, this is a story about realizing that you are the bomb, about not knowing how to diffuse yourself, about no one else knowing either. We the Animals is more than a story about an abusive father, or an emotionally inept mother, or two violent brothers headed nowhere good. What makes this story so powerful is the way in which the narrator makes us feel so much love for these broken people. At the end of the book, each of these characters redeem themselves in some small way, reminding us that while he doesn’t necessarily fit into his family, he belongs to them, and they belong to him. i like how you really got Justin Torres’ novel – coming of age and that sort. i also read it and had just about the same feelings evoked. great review!